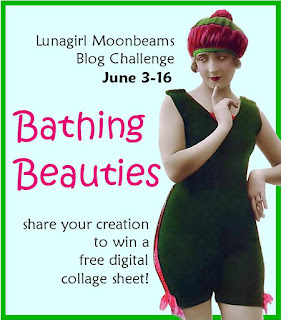 Time to start submitting your entries for the next Lunagirl Moonbeams Blog Challenge: Bathing Beauties! This challenge (#3) will end at 11:55 pm on June 16 ~ The winner will be selected randomly and will receive a free Lunagirl digital collage sheet of his or her choice. Please link back to my blog and/or Lunagirl.com on your site if you have one. Of course I love if you use at least one Lunagirl product, but I'm not going to worry about that either so no rule there! Most important is have fun, get creative, enjoy vintage. 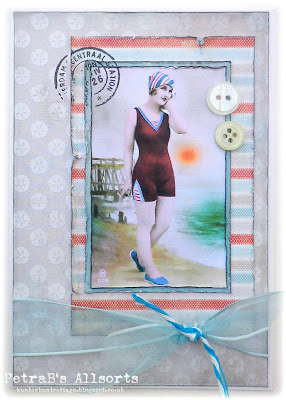 To start your creative ideas going, here are some lovely bathing beauty creations by the Lunagirl Moonbeams Design Team! LUNAGIRL digi sheets and LUNAGIRL images on CD. 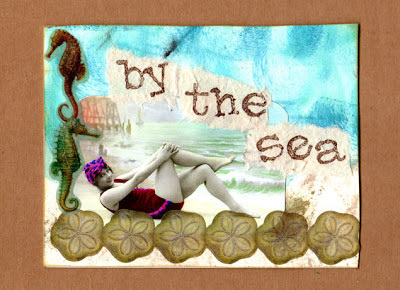 Petra Berendsen: "The beautiful image of a bathing Beauty is from the digital collage sheet Bathing Beauties. The image is set on various layers of Authentique paper. All edges are distressed with Black Soot distress ink. I embellished the card with a stamped postmark, buttons, organza ribbon and bakers twine." Great, milissa! Welcome and good luck! I'm about to enter the challenge, but I don't see any challenge rules. There sure must be some rules. Without rules, the world will break into chaos! Anyway, I'll link up my entry in a bit, after searching a bit more for rules! I guess I'm a little on the wild side b/c I hadn't thought to set up rules until earlier today when I saw someone else had some on their challenge! That is a fast reply! I'm all set then :) I had made this card this morning for another challenge and was checking other challenges, as I used an image I don't use often and wanted to show it around hehe. 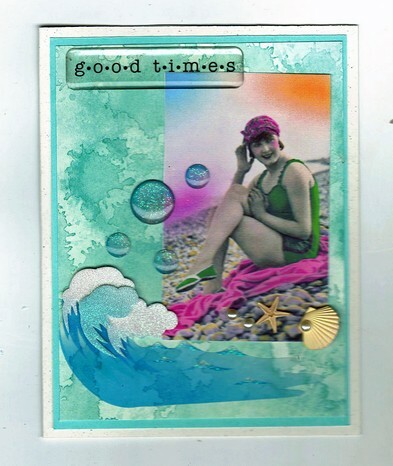 Also, it was my first try at a vintage card. Next time I am going to bend the rules and try to make a vintage card for a man. Although maybe that is too hard a challenge for myself. 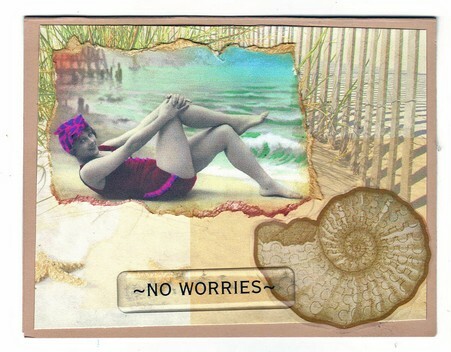 Can a card have no lace, flowers or ribbons and still be/look/feel vintage? Past bedtime for me here now ( in the Netherlands), so goodnight! I'm going to think of vintage cards for a man, (a man that doesn't like lace, ribbons, or girlyness on a card). To answer your question, I think "vintage" style definitely does NOT have to include lace, flowers, ribbons, etc.! Vintage does not have to be synonymous with frilly or frou frou; even "Victorian" is more than lace and flowers. Vintage can be simple, elegant, gothic, dark, playful, art deco, art nouveau, sinister, inspiring, wistful, masculine, feminine, Victorian, Edwardian, Regency, shabby, cottage, retro, mid-century, or any/all of the above! Thanks for a really fun challenge! Love the DT pieces! Thanks for another great challenge. The design team samples are fabulous. My favorite this time is Michelle's! Thanks for another great challenge and wonderful DT samples. Thanks, this was such a fun challenge...when I at last got going! Looking forward to the new challenge!